Affiliate marketing is one of the simplest methods to make some quick bucks. For the past few years, I have been using affiliate marketing to generate some income as part of my multiple income portfolio. If you do a quick Google search, you will realise that many bloggers are using affiliate marketing as one of their income sources. Some of them can earn more than $50,000 a month through affiliate marketing. I have my doubts but I can’t deny that affiliate marketing is indeed a good way to earn some extra cash. It doesn’t hurt to give it a try to cover your daily expenses. It is not difficult to start affiliate marketing. Most importantly, you must be willing to invest time and effort in building your profile. In a nutshell, you drive sales and earn a commission. You help the vendors to sell their services or products and they give you a fraction of their earnings. Yes, you are a salesman except that you don’t go block-by-block knocking the doors. You will have control overs the products and services that you are selling. There are many affiliate programs in Singapore. In the recent years, more vendors in Singapore has started to realise the importance of affiliate marketing. Face it, words of mouths are a very powerful marketing tools. How many of you don’t read reviews before you purchase a gadget? You do not have to create your own products or services. If you aspire to be an entrepreneur, I suggest going for other business models. Ultimately, affiliate marketing will not be able to satisfy your business objectives unless you are going to create a product or service. If you are good enough, eventually you can create services that help other people in building their affiliate marketing portfolio. If you are the kind of person who’s just looking for a method to earn a quick buck, affiliate marketing is the simplest method I know to achieve it. You do not need to own a shop. All you need to do is to copy and paste your affiliate links to a group of potential buyers. First, you need to sign up at least one of these affiliate programs. Once they have approved your account, you can start to generate your personal affiliate links to promote the products. When someone clicks your link and make a successful purchase, you will receive a commission. Easy huh? That’s just the start of your journey. The hardest part of affiliate marketing is to drive successful sales. There are many affiliate programs - Qoo10, Clickbank, InvolveAsia, Amazon, Lazada etc… If you are very new in affiliate marketing, I suggest picking one to learn before moving on to other programs. In the long run, it will be easier if you have a website promoting your affiliate links. The return of investment is definitely worth your time and effort. But if you are a beginner, you can first attempt to share the links on social media. In the next few sections, I will use Qoo10 affiliate program as an example to share some of the basic things you need to know about affiliate marketing. I was having a hard time trying to understand the difference between the curator program and the normal affiliate program. When I was googling, someone said that the curator program is supposed to be the affiliate program. This is so wrong. I kind of think that the author did not try Qoo10 but claimed that he’s an expert. Meh. 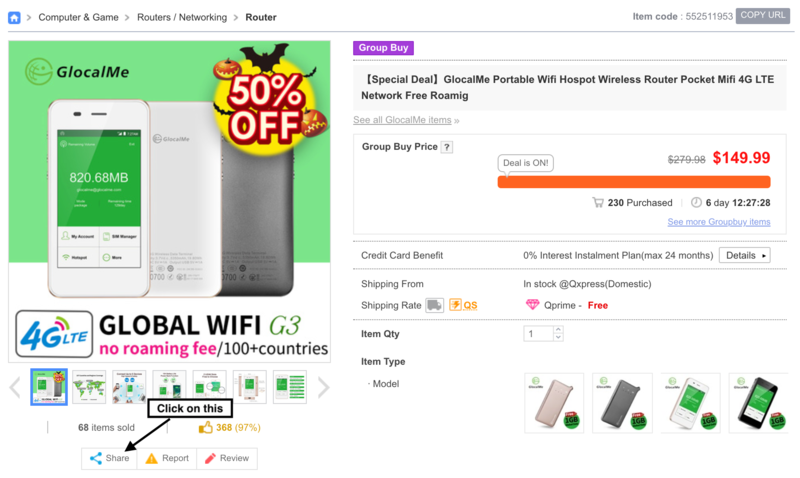 A shopping curator is someone who gathers a gallery of products and shares good deals on Qoo10. It’s a community of fellows but it is not the affiliate program. You can share affiliate links but you do not need to join curator program in order to generate affiliate links. All Qoo10 members are enrolled in Qoo10 Affiliate Program automatically. You do not need to join the curator program to get a commission. In order to ensure that you are able to receive your commission, you need to ensure that the transaction is made through or after clicking your customised links. The amount of reward is reflected on the popup page. In the above example, you can earn $4.99 from the product. 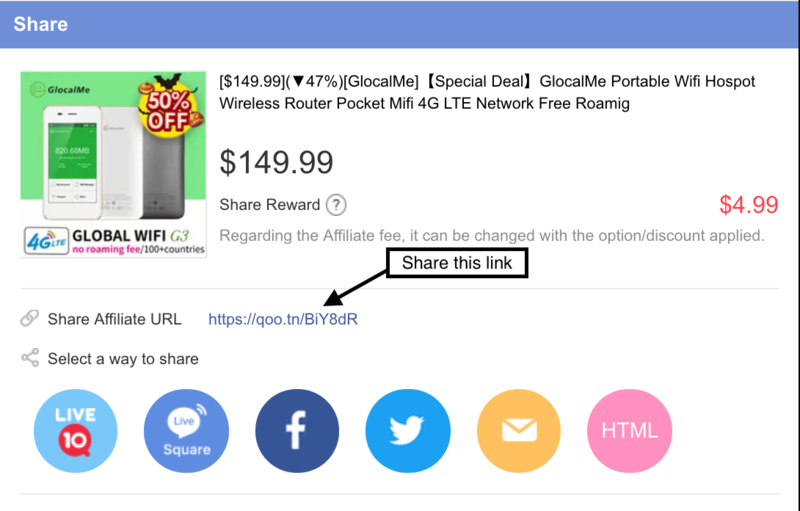 You can share your affiliate links to any places and pray that someone clicks and purchase the product. How Much Can I Earn Per Sales? For every single successful transaction, you will earn 1~2% of the product price. You will yield 1% if your sales are driven from Qoo10 website (e.g. Live Talk or Bazaar). So most of the time you should be able to get 2% commission. This means that you will get $1-$2 for every S$100. That’s why you will only get $4.99 for a product that costs $149.99. If you do a simple calculation, you need to sell S$75,000 worth of products every month to earn S$1,500 per month. Is S$1,500 enough to sustain your lifestyle? Yep, it’s not possible to earn enough if you are going to rely on Qoo10 affiliate program. Most bloggers I know are relying on other affiliate programs. Most of them have multiple websites and sells multiple high value products. You will need to do the same if you dream to work as a full-time affiliate marketer. Like what I have mentioned earlier, I have my reserves when someone says that affiliate marketing is their sole income. Often, they exaggerated their sales so that they can convince you to purchase their course materials. Remember, every single thing that you see on the Internet can be fabricated. But I do believe that it’s manageable to get a few sales per week. If you are able to sell something more valuable, you might be able to get a sum of decent money that can help to cover some of the minimal expenses (e.g. transport). I was able to earn about $20 per week when I was actively sharing my links and writing contents. That was enough to cover my monthly transport expenses. How to Generate More Sales? First, you need to find the right leads and promote the items at the right time. If you have been doing affiliate marketing but not getting any sales, chances are you are promoting your affiliate links to the wrong group of audience at the wrong time. Now, you don’t have to work like an offline salesman. You don’t have to knock every single door you can find. But you do need to find the right platform to attract the right group of audience. Just imagine yourself sharing a male product in a Facebook group that is made up of majority ladies… How does that generate any sales? I have seen many people sharing their links on their personal Instagram and Facebook. Eh honestly, nobody in your friend list cares about what you are trying to promote unless you are sharing something that’s really awesome. You might want to be more targeted in terms of your audience to ensure that you are investing your tremendous effort at the right people. If you are going to promote seasonal items, then make sure you promote them during the right period. When I first started out affiliate marketing, I targeted Facebook groups. I wouldn’t say that it’s very successful but I still manage to cling decent sales. So the short answer is… no you don’t really need a website to get started. However… a website with great content can become a very good funnel for your affiliate links. Think of your own purchasing habit: Do you read online reviews? Do you do comparisons before you purchase the item? But to build an affiliate website it’s not so trivial. SEO, keyword research and analysis, and Google ranking are very important in making your affiliate website works. This will be a whole new topic and I will not cover them in this article. My advice is start something and learn more about the techniques before going in-depth and building a website. Through my personal experience, it is possible to earn money through affiliate marketing. It is easy to set up. Once you have invested enough time and effort, you will find that the subsequent steps are almost a breeze. The hardest part of affiliate marketing is to find the right platform to generate sales. In order to succeed, you will need to strategise your marketing plans and make sure you are targeting at the right audience. Once you get the hang of affiliate marketing, you can most likely expand your experience into other affiliate programs.